In order to explain why I switched from Canon to Sony, I must explain what type of photography I do, in order to put my evaluation into context. I am a professional photographer that has been using Canon cameras and lenses for the past 30 years. I started with the AE-1 model, when photography was still a hobby for me, and moved up to the flagship EOS-1V when I turned pro. The type of photography I do is very specific and requires special skills and equipment. I am a Unit Still Photographer, which basically means I shoot on movie sets. Most people think that movie stills they see in magazines and newspapers come out directly from the movie print, but in fact, there is a still photographer on set working every day, side by side with the camera crew, capturing those amazing stills. The purpose of these stills is to entice the paying audience want to go see the movie. Still photographers have a major limitation when shooting on a working movie set- sound! Sound is recorded through a boom mike or microphones that the actors wear. These microphones pick up any sound on the set, which makes it impossible for still photographers to shoot while they are filming. The only way around this, when I started working as a still photographer, was to use a sound blimp, which is a padded housing that covers the camera in order to reduce the sound of the shutter click. At that time, the only option was the blimp housing made by Mark Jacobson, in Los Angeles (http://www.soundblimp.com). These blimps are bulky and add considerable weight to the rig hanging from your neck. Sound Blimps have a shutter button that connects via an internal cable to auto-focus cameras, so I had to upgrade my AE1 to the EOS 1V in order to be able to shoot on set. Once the back cover of the blimp is closed, you do not have access to any of the buttons on the camera, except for the shutter and auto-focus. Years later I was one of the first still photographers to switch to digital cameras, when the Canon D30 came out. Digital SLR’s are as noisy as analog cameras, because they have a moving mirror and a shutter, so the only advantage of shooting digital was that I could see what I was shooting in the LCD monitor on the back of the camera. But at that time Jacobson did not make blimps with windows in the back cover, so I had a tool shop cut out a window on my blimp. Sound blimps are not perfect. They reduce the sound of the camera- not eliminate it. For most shooting conditions on a movie set, the noise reduction is enough to permit me to shoot while film cameras are rolling, but on intimate scenes in a studio, when the actors are speaking softly, the shutter noise of my camera can be heard through the blimp. This is a problem, and I have missed many great shots because of this. Canon added a feature to their new cameras, which is a life changer for us still photographers- silent mode. This feature reduces the sound of the shutter considerably, and in combination with the sound blimp, now allows me to shoot freely on very quiet movie sets. I have been loyal to Canon, always updating my cameras to the latest model, and taking advantage of all the new features and technology, but fervently wishing they would someday come out with a silent camera. My wish came through, but not via Canon. I had been hearing other still photographers rave about the new mirrorless cameras in the market, specially Canon and Fuji. These cameras are 100% silent and have an electronic viewfinder, instead of the traditional optical, see-through viewfinder. I thought this was a cool novelty, but it was not enough to make me switch camera systems. In fact I was not even interested in testing out these new cameras. So I continued using Canon gear for several more years. But last year I had the opportunity of using Sony cameras on a major movie set, and it was a life changing moment for me! I was working on Alita: Battle Angel, a $200 million James Cameron film directed by Robert Rodriguez. In the middle of production I got contacted by a Sony Electronics Sr. Business Development Manager telling me she wanted to send me camera gear to test and try on set. She sent me the a7SII and the a7RII cameras, plus a case full of their top lenses for me to try out for two weeks. I was so impressed with these cameras that I asked the Sony manager to allow me to keep it for a full month. I was blown away by the results I was getting with these cameras and lenses. I used the a7SII on the movie set, while using the a7RII for studio work. When working with Robert Rodriguez I have a permanent photo studio set up in a sound stage, and I regularly use it to shoot all the characters of the movie. I was impressed by the sharpness of the 42 megapixel a7RII. The only drawback was that it took a second for the image to appear on the LCD monitor, but this was probably due to not using a high performance memory card. Most of my daily work is on a movie set, and that is where I was blown away with the a7SII. This camera is 100% silent, so it allows me to shoot without a sound blimp. This is HUGE, because now I am able to not only shoot in very quiet moments without the bulkiness and weight of the blimp, but it allows me to obtain shots I could never get before. For example, there was a moment that the 3D camera rig, mounted on a crane, was extended and hovering just inches off the ground, aimed tilted up at an actor who was sitting on the floor. I squatted next to the camera rig and extended my arms positioning the a7SII in the space between the camera rig and the ground. I tilted the LCD monitor towards me so I could see what I was shooting, and I was able to capture a shot I could only have dreamed of using a sound blimp. Due to the weight and bulk of the sound blimp, shooting in live view mode is not practical. The second life changing feature of this camera is the amazing sensitivity it has to light, and it’s wide dynamic range. I was regularly shooting at 6400 ISO and even higher, and was obtaining crisp images with relatively no noise. I am weary of pushing the ISO too high on my Canon cameras. What follows is my complete evaluation on the use of the a7SII on a movie set. I not only mention the great features that have turned me into a Sony fan, but also the things I don’t like about the camera and recommendations for future models. I am amazed by the sharpness and detail of the image shot under very low light level. It blows away the Canon cameras I have been using. I now regularly shoot at very high ISOs, something I would rarely due, because of the added noise degradation. The extended dynamic range is incredible, giving me a lot of detail in the shadow areas. the tilt monitor is a big plus, allowing me to shoot in ways I could never do before. With the sound blimp I am limited to shooting with the camera pressed against my face- with the Sony cameras I can now extend the camera as far as my arm allows, and use the tilt monitor to frame in live view mode. the viewfinder is sharp and displays the set color balance and exposure accurately. The advantage of using an electronic viewfinder over an optical viewfinder is that you what you see is exactly how the image will look once it is captured. You are able to visualized quite accurately what the final shot will look like, as you set the exposure and color balance. You see what the camera sees, not what the eye sees. the focus lock button on Sony lenses is an excellent feature. I no longer need to constantly focus and reframe between shots. I can lock the focus and shoot away. 5 axis image stabilization is built into the body. This is very convenient, as you are not relying on image stabilization lenses. Servo auto-focus works terribly. Camera is not good for shooting action that moves to or away from the camera, because the auto-focus cannot track the action. I hope this is resolved in the next version of this camera. I know Fuji XT-1 had this same problem, but they resolved it in the XT-2. The sensor behind the camera which switches the monitor to go off and the viewfinder to switch on, is too sensitive. When trying to shoot with the camera away from my face, looking at the monitor, if you pass your finger 2.5 inches away from the sensor, it turns off the monitor and reverts to the viewfinder. This is very annoying, specially when trying to capture the right moment on a movie set. It would be nice to be able to have the option to have the monitor never go off, even if this means less battery life. In other words, give us the option to set the camera so that when we look through the viewfinder, have the camera detect this and turn it on, but leave the monitor on, instead of turning it off. the electronic viewfinder takes too long to start up when first pressing on the shutter button. It takes about a second to come on, which sounds trivial, but when you are on a movie set and work fast, it is very annoying. Turning Auto View off speeds it up, making the monitor turn on immediately, but the viewfinder still lags behind. the front dial should be able to be locked, because it is easy to inadvertently change the aperture and shutter settings. It is prone to be moved accidentally, because it sits at the top of the hand grip, next to where the right index finder sits. I have a suggestion- there is a wheel on the back of the camera used for scrolling through the photo files when in Play mode. But when in shooting mode, spinning that wheel does nothing. Why not move the aperture control setting to this wheel and get rid of the front dial completely. Beef up the spinning wheel- make it thicker, so it feels more solid. This would then resemble the Canon quick dial, which is one of the best features I have seen in any camera make. What I miss the most from my Canon cameras when using the A7SII is the joystick at the back, which allows me to move the image in the monitor, when zoomed in. I also miss the quick-dial, which allows me to move to a prior image, even if I am zoomed in to the previous one, maintaining the zoom amount in the new image I scroll to. Sony’s system is awkward and counter intuitive. Granted that it is partly due to the fact that I am used to doing it another way on a different camera, but I feel that the process could be streamlined. For example, when wanting to view the last image on the monitor, you have to press the play button at the bottom of the camera, but to zoom the image you have to press the button on the top of the camera. It makes more sense to have the zoom button next to the play button, where the trash button is now, or put the zoom button between the play and trash button (see my retouched photo of the camera body at the end of this article). the lens release button is in the wrong side of the camera. Why did they position it next to the grip? If you have big fingers it makes it awkward to reach. Would have made more sense to place it on the opposite side, with an unhindered access. having a tilt monitor that swivels out and up and down is excellent, but would be nice if it also swiveled to the sides. when viewing through the electronic viewfinder, there is a lag between shots, which makes it very annoying to shoot bursts, because I cannot see the action in real time. There is a way around this problem, by turning off the Auto View, but then the last shot does not appear in the monitor, unless I press play. I don’t always look at the monitor to see what I shot, but when I do, it is nice to be able to see the last shot appear there without me having to press play. I am used to this, because Canon does it this way. Perhaps the next firmware can add the ability to have the monitor do auto review when turning off auto review for the viewfinder. Sony lenses are sharp and focus accurately and rapidly, but when using Canon lenses and a Sony to Canon lens adapter in low light, the camera sometimes has a problem finding focus. Note: An earlier complain of mine was that it was difficult to tell if I am shooting while shooting bursts, because the change from one shot to the next as seen through the viewfinder is too subtle, but I found a way around this. I was shooting Spd Priority Cont. By switching over to Con.t Shooting the burst is slower, but at least the change between photos is more apparent. The A7SII is a game changer for the type of photography I do. 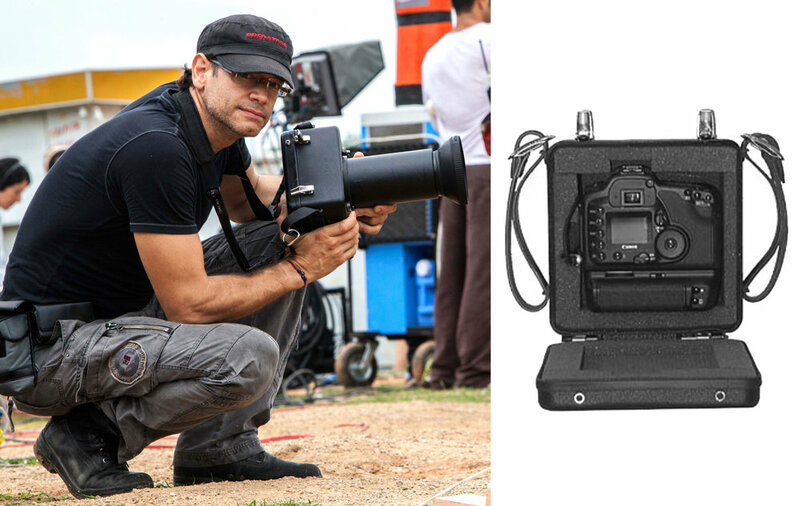 Shooting stills on movies is an art form that requires different skill sets, and the latest and best camera gear. The movie cameras used today are extremely sensitive to light, and in the past few years I have noticed a rapid trend among directors of photography to use less light to illuminate the scene. This causes us still photographers to rely more on prime lenses instead of zooms, with the lowest aperture possible, and the latest camera with the highest light sensitivity. It also creates a very challenging situation, because we are limited by the aperture of our lenses, so are forced to increase the ISO considerably in order capture a well exposed image. But by raising the ISO we must contend with increased noise, so we have to find a balance between high ISO, low shutter speed, and acceptable levels of noise. The A7SII is a game changer, because of the high sensitivity of the sensor, and its high dynamic range, which allows me to shoot at a dizzyingly high ISO setting, but still retain detail, sharpness and very little noise. I find that the design of the camera is not very user friendly. After one week of using the camera, I still had to think about which Custom Key Button to press to change focus settings, white balance, etc. I hope that future upgrades to this camera makes it more user friendly. But the results I am getting from the shots I am taking in low light settings makes me overlook all the other shortcomings the camera might have. I can sacrifice comfort for quality. The photo on the left, below, is what the back of the A7SII looks like. The photo on the right shows the changes I would like to see to the camera, to make it more user-friendly. I moved the zoom button, as described above, beefed up the round dial on the back, and moved the Menu button to the right. Having it on the left causes the eye sensor to trigger the viewfinder, turning off the monitor, when passing the finger in front of the viewfinder to reach the menu button, which is very annoying. I have been using the A7SII in my still work since last year, but was not ready to get rid of my Canon gear. Until now. Sony has recently released the A9 and the A7RIII. The technology that is jammed into these cameras is so far advanced over the competition, that I am now making the full move over to Sony. If you get a chance to test the A9, you will be blown away by the focusing technology it incorporates. It is a game changer! Here are some useful links of articles that describe the comparison between the Sony a9 to Canon cameras. Sony Alpha A9 vs Canon EOS 5D Mark IV - Which is Better?